When Big Dog was 4.5 months old, he was injured at daycare. Injured is kind of an understatement, his leg was broken. We don't know what happened because the daycare provider claims nothing happened. She refuses to acknowledge that he was injured in her care. She claimed that he was gassy, and cranky due to that. I believed her, after all I had been very careful in interviewing daycare providers. I opted for a family daycare in someone's home instead of a daycare center because I thought that was a more loving option. That a mother would take better care of my baby than an underpaid teenager in a larger center. I felt like I knew this woman, I spent a lot of time with her since I nursed Big Dog at drop off, I nursed him at lunch every day and talked to her while I did. He was never left there for more than 4 hours without me visiting to nurse, and that kind of constant presence in any environment makes you feel like you really "know" the people you see there. I took him to the doctor the next morning after a very tough night and he was diagnosed with a stomach bug. I guess it is hard for even a professional pediatrician to diagnose a broken bone if they are given the wrong symptoms. After giving him tylenol and helping him with the pain, we noticed that he was not moving one of his legs. We called my brother in law, who is a pediatric cardiologist, when the advice nurse didn't call back right away, and he said it was possible that he had an infection in the joint of his leg due to the viral illness that was causing the stomach bug. He told us to take him to the ER if we were worried, and we did. The ER doc said that she thought it was a viral infection and in fact she had just diagnosed another child with a similar illness, but just to be safe, she ran some x-rays. When the x-rays came back, it was discovered that Big Dog's femur was broken. We called his daycare provider and she said she didn't know anything about it. And that is where my life fell apart. Any significant unexplained injury to a child has to be investigated by CPS. Since there were no witnesses, and she refused to take responsibility, we were investigated as well. I spent two months of my life deathly afraid that I was going to lose my child. I was reassured by the case worker that no one believed that I had done anything, but it had to be investigated thoroughly. Even the ER doc who found the broken bone had a letter placed in our file saying she firmly believed that we were not responsible for his injury. We spoke with social workers, police and investigators but ultimately the case we set as "inconclusive" instead of "unfounded" because there was no clear explanation of the injury from any party. Had the daycare provider simply admitted that something had happened, we could have been completely exonerated, but short of that, this was the best outcome we could hope for. Normally a case is only open for 30 days, but the case worker we were dealing with kept it open longer to try to get enough evidence to have a claim against the daycare provider. Unfortunately that never was able to happen, so she was able to continue offering childcare despite her lies that kept Big Dog from getting the correct medical care right away. Why do I bring this up now? Well apart from the fact that I still think about this frequently and it still fills me with anger that nothing happened to her as a result of her negligence and dishonesty, Little Dog got a black eye this morning. Nothing unusual, I know. He was running around the living room like a crazy beast and he fell and bumped the corner of his eye on the corner of a chair. A clumsy sequence of events, but nothing out of the norm. I can't help but remember the injury that Big Dog had and how we became suspects in a child abuse investigation. 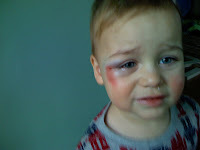 I know that children get injured all of the time, and little boys, especially those with a wild side, are frequent visitors to the doctor and even the ER with various bumps and brusies, black eyes and even broken bones. I think for the rest of my life, I will always worry that any injury will be misunderstood, that any accident will be misinterpreted, that at any moment we will be considered abusive no matter how loving and careful we are with our kids. Sadly, this is what I carry with me from our first childcare experience, and I don't think I will ever be completely rid of this constant low grade terror. I totally understand now why you are so on edge about Ansel's boo-boo. What a horrible experience for you.